› Author Affiliations Funding This project was supported by grant R01HS020921 (Electronic Surveillance for Wound Infections after Ambulatory Pediatric Surgery) from the Agency for Ambulatory Pediatric Surgery. The content is solely the responsibility of the authors and does not necessarily represent the official views of the Agency for Healthcare Research and Quality. 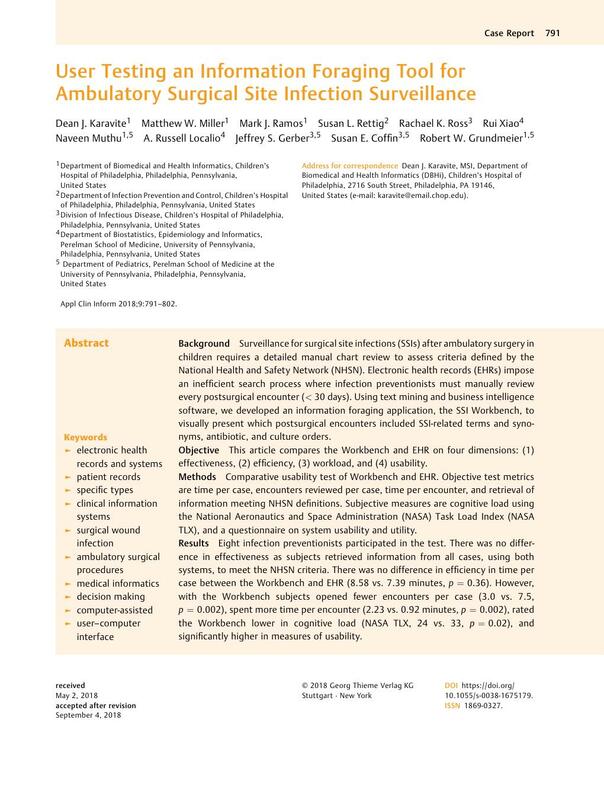 Background Surveillance for surgical site infections (SSIs) after ambulatory surgery in children requires a detailed manual chart review to assess criteria defined by the National Health and Safety Network (NHSN). Electronic health records (EHRs) impose an inefficient search process where infection preventionists must manually review every postsurgical encounter (< 30 days). Using text mining and business intelligence software, we developed an information foraging application, the SSI Workbench, to visually present which postsurgical encounters included SSI-related terms and synonyms, antibiotic, and culture orders. Objective This article compares the Workbench and EHR on four dimensions: (1) effectiveness, (2) efficiency, (3) workload, and (4) usability. Methods Comparative usability test of Workbench and EHR. Objective test metrics are time per case, encounters reviewed per case, time per encounter, and retrieval of information meeting NHSN definitions. Subjective measures are cognitive load using the National Aeronautics and Space Administration (NASA) Task Load Index (NASA TLX), and a questionnaire on system usability and utility. Results Eight infection preventionists participated in the test. There was no difference in effectiveness as subjects retrieved information from all cases, using both systems, to meet the NHSN criteria. There was no difference in efficiency in time per case between the Workbench and EHR (8.58 vs. 7.39 minutes, p = 0.36). However, with the Workbench subjects opened fewer encounters per case (3.0 vs. 7.5, p = 0.002), spent more time per encounter (2.23 vs. 0.92 minutes, p = 0.002), rated the Workbench lower in cognitive load (NASA TLX, 24 vs. 33, p = 0.02), and significantly higher in measures of usability. Conclusion Compared with the EHR, the Workbench was more usable, short, and reduced cognitive load. In overall efficiency, the Workbench did not save time, but demonstrated a shift from between-encounter foraging to within-encounter foraging and was rated as significantly more efficient. Our results suggest that infection surveillance can be better supported by systems applying information foraging theory. D.K. designed the Workbench, developed and facilitated the test, analyzed data, and authored and revised the manuscript. M.M. contributed to literature searches, design of the Workbench, and manuscript editing. M.R. developed the Workbench and contributed to generating study data. S.R. contributed to the design and testing of the Workbench and manuscript editing. R.R. contributed to methods, study design, participant randomization, data analysis, and manuscript editing. R.X. contributed to study design, data analysis, and manuscript editing. N.M. contributed to study design and manuscript editing. R.L. contributed to study design and manuscript editing. J.G. was project co-PI, contributed to literature searches, study design, and manuscript editing. S.C. was the project PI, led the team in study design, analysis, and manuscript authoring and editing. R.G. contributed to Workbench development, study design, and manuscript editing. This study was reviewed by the Children's Hospital of Philadelphia Institutional Review Board.